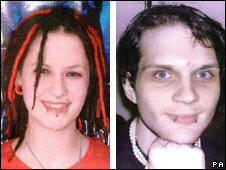 Two teenage boys have been jailed for life for the murder of a woman who was killed for dressing as a Goth. Sophie Lancaster was kicked and stamped to death by Brendan Harris, 15, and Ryan Herbert, 16, in Stubbylee Park in Bacup, Lancashire, last summer. The pair turned on Miss Lancaster, 20, in an act of "feral thuggery" as she tried to get them and three other youths to stop attacking her boyfriend. 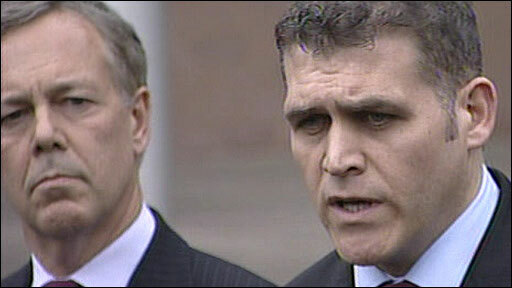 Harris must serve a minimum of 18 years and Herbert 16 years, the judge said. Miss Lancaster, a gap-year student, cradled 21-year-old Robert Maltby as she begged the gang to stop beating him in the park in August 2007. Harris and Herbert then turned their violence against her. The attackers did not know the couple, who were both Goths, and the only motive was they simply looked different, the court heard. Three other teenagers, two aged 17 and a 16-year-old were also jailed for the attack on Mr Maltby. Passing sentence at Preston Crown Court, Judge Anthony Russell QC described the attack as "feral thuggery" which raised serious questions about the "sort of society which exists in this country". He added: "This was a terrible case which has shocked and outraged all who have heard about it. "At least wild animals, when they hunt in packs, have a legitimate reason for so doing, to obtain food. "You have none and your behaviour on that night degrades humanity itself." The judge described the Goth community as "perfectly peaceful law-abiding people who pose no threat to anybody". He said: "This was a hate crime against these completely harmless people targeted because their appearance was different to yours." Goths emerged as a youth subculture in the early 1980s. Although initially used to describe a form of music, it has evolved to encompass literature, art and fashion, with its exponents typically dressing in dark clothing. Earlier, the judge heard that Mr Maltby, who was not in court, now finds the world terrifying and still suffers long term physical and emotional damage. In a statement read to the court, Mr Maltby said: "I really just like to think I'm now only eight-months-old. "I'm finding the whole world a terrifying place." 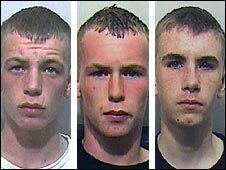 Brothers Joseph, 17, and Danny Hulme, 16, both of Landgate, Whitworth, near Bacup, and Daniel Mallett, 17, of Rockcliffe Drive, Bacup, all pleaded guilty to grievous bodily harm with intent on Mr Maltby. 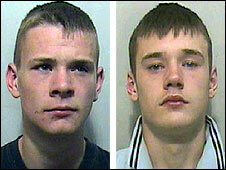 Mallett was sentenced to four years and four months and the Hulme brothers for five years and 10 months each. Brendan Harris had denied murder, but was convicted last month, while Ryan Herbert pleaded guilty before the trial started. After the hearing, the Chief Crown Prosecutor for Lancashire Robert Marshall said: "Very occasionally, in spite of all the tragic and distressing cases that the CPS has to deal with, we come across a case that stands out as truly shocking. "The murder of Sophie Lancaster and the vicious attack on her boyfriend Robert Maltby stand out for their utter pointlessness and sheer brutality. "Worse still, it seems very likely that the attack started as a form of amusement for those involved." He extended his sympathy to the families and outside court, Miss Lancaster's brother, Adam, 23, thanked people for their support. "Although the sentences seem fitting and appropriate, no sentence is long enough to compensate for the loss of Sophie," he said. His mother, Sylvia, added: "Justice can never be done because it will never bring her back."